Exhaust System - Orinda Motors Inc. 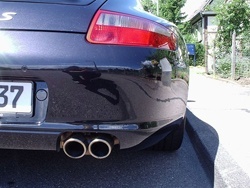 If your vehicle’s exhaust system needs attention, come to Orinda Motors. Not only can we handle complete smog testing, we can also provide any required auto repair so your vehicle can pass any emissions test. Exhaust gases come along with the territory of owning a gasoline powered vehicle, and they are noxious. To protect the environment and your health, our auto mechanics will address any repair issues with your exhaust system. Your vehicle’s exhaust system should be inspected periodically for damage that could cause restriction of the exhaust. The exhaust system should also be periodically inspected for leaks that could become potentially harmful to occupants of the vehicle. A restricted exhaust or a leaky exhaust may result in a loss of power and affect your fuel economy, so it is always smart to have the ASE-Certified auto mechanics of Orinda Motors examine it for repair. Our Orinda Village location has a comfortable waiting area and is located near several stores and restaurants, Safeway, Starbucks and the Orinda Library, so you can go explore the area or catch up on work while you wait for your exhaust system service to be complete. If you choose not to wait for the completion of the exhaust system service, we offer a free shuttle to BART, home or work. We also offer pickup and delivery of your vehicle for no extra charge! If you need a car we also have Orinda Auto Rental located on the premises. Orinda Motors offers all the services required for your vehicle’s exhaust system service and it is our goal to always provide great service and high-quality workmanship with the best value possible. Seriously, our goal is to prevent your exhaust system from exhausting you or your budget. If your vehicle is ready for exhaust system service, either schedule an appointment, call us, or stop by for a visit at 63 Orinda Way, Orinda, CA 94563.